Forget about the hassle of finding a taxi and take it easy in the Big Easy with a convenient and safe ride to your destination from the Louis Armstrong New Orleans International Airport. 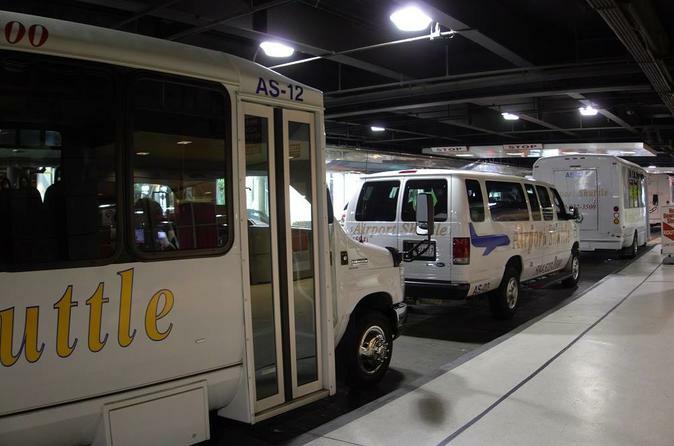 Airport Shuttle New Orleans is the official transportation service for the New Orleans International Airport and includes a fleet of clean-burning, propane-fueled vans and minibuses. Our professional and courteous drivers will take care of all of your transportation needs from the airport to your hotel! Getting to your hotel has never become more hassle-free! Our professional and courteous drivers will get you to hotel safely all while giving you a grand tour of one of the world's most magical cities. As you ride comfortably in an air-conditioned shuttle, enjoy the sights of the city while watching an informative digital display showcasing some of the hottest attractions and restaurants in the area. Our services from the airport are available 24/7 with vehicles departing approximately ever 30 minutes. Please provide your printed voucher/confirmation email to any Airport Shuttle ticket sales representative who will exchange your voucher/confirmation for an Airport Shuttle New Orleans ticket. Then present your Airport Shuttle New Orleans ticket to your driver. Remember first 3 bags per passenger are free! If Wheelchair-Accessible Service is needed, please call 866-596-2699 for assistance and details 24 hours in advance. With prior notification we will schedule a lift-equipped vehicle for your transfer. Wheelchair-Accessible Shuttles are available until the last flight daily. We are a 24/7 operation with representatives on call at the Airport. If you have any question, visit our website www.airportshuttleneworleans.com or call (504) 522-3500.